Mammy’s Cupboard is a roadside business located ten miles south of Natchez on Highway 61. 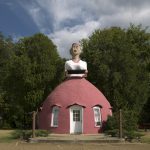 It is a popular culture icon much like other oversized figures across the nation—Paul Bunyan in the Upper Midwest, Indian teepees in the West—that draw from regional or state imagery to attract travelers. Mammy’s Cupboard is linked to evolving southern ideology, and it is especially connected to Natchez’s celebration of the Old South. Natchez businessman Henry Gaude built Mammy’s Cupboard in 1939 to attract visitors headed to the Natchez Pilgrimage, an elaborate tour of plantation homes that began in 1932. 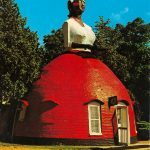 The twenty-eight-foot high building was constructed in the shape of a slave woman with hoop skirt—a mammy figure. She originally had earrings made from horseshoes and a serving tray in her hands, with white hair and a red head scarf that suggested maturity and modesty. The figure’s exaggerated black color, white circles under the eyes, and bright red rouge drew from minstrel makeup conventions and from standard racist imagery of blacks at the time. Designers of Mammy’s Cupboard drew from the long-established mammy icon, a deeply rooted symbol of the plantation household. The black domestic servant was a key to the functioning of the antebellum plantation, and families sometimes invested her with moral authority and status not given to other slaves. But her position created special tensions and anxieties with white plantation women who owned such servants but at times relied inordinately on them. Southern writers, artists, and promoters created the myth of mammy—a loyal, maternal slave woman who devoted herself to the nurture of her master’s family. She was strong, innocent, and fundamentally asexual, supposedly making her a natural to live happily as a human chattel. The mammy figure assured white southerners that their households, with slave and free people living intimately together, were organic and harmonious, without jealousies, sexual attractions, or conflicts. The mammy became a sentimental image, reflecting the sometimes real feelings of affection and dependence across racial lines but also revealing white cultural expectations about black subservience. After the Civil War the myth of mammy became an emblem of North-South reconciliation, as songs, stories, plays, paintings, and advertisements from Broadway to Hollywood as well as below the Mason-Dixon Line promoted the long-suffering figure of the contented black domestic worker. The Natchez Pilgrimage created an idealized world of Old South beauty, represented by the city’s mansions. Promoters soon added a Confederate Pageant to celebrate the Lost Cause. This historical memory had only a limited role for black Natchez residents, who wore bandanas or livery for the pilgrimage and sang spirituals for the pageant. 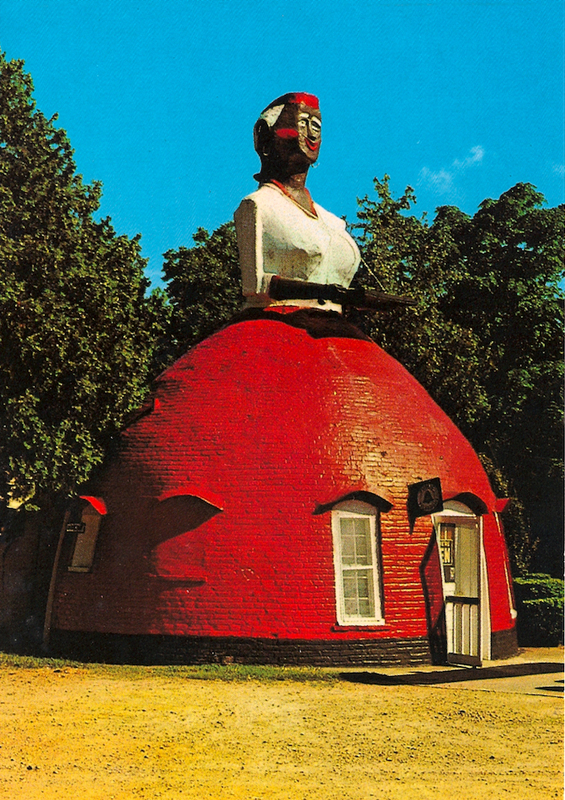 As Lori Robbins notes, Mammy’s Cupboard was a “low culture” attraction that survived symbiotically with the “high culture” Natchez Pilgrimage, surprisingly presenting a giant black woman as the featured figure. Originally a café, Mammy’s Cupboard went on to house a gas station, convenience store, gift shop, and an arts and craft center before again becoming a restaurant. During the era of the civil rights movement, racial tensions led the Gaude family to paint the figure as an Indian woman instead of a black slave, but this change was short-lived. Subsequent owners have softened the figure’s decorations, downplaying harsher racial stereotypes. They removed the horseshoe earrings and most of the figure’s makeup while lightening the skin to suggest ethnicity but not necessarily race. These changes have been in keeping with the spirit of the times. The nearby Natchez Pilgrimage has added a Freedom’s Road black history presentation, and black historical buildings are now part of touristic Natchez. Still, this figure’s physical build, age, and dress (especially the hoop skirt and head scarf) portray a stereotypical slave in line with the old mammy imagery. 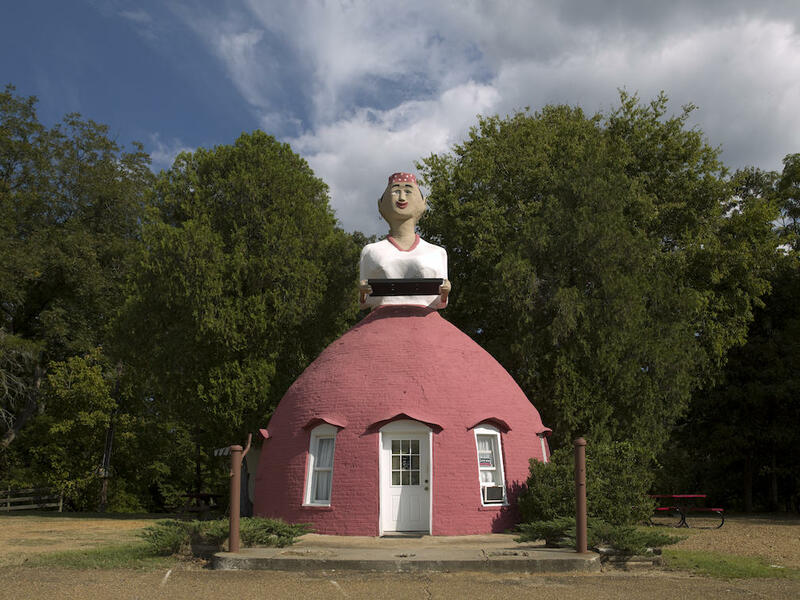 Today, Mammy’s Cupboard serves up pies and other delicacies for Natchez residents and travelers attracted by the giant figure.